1) To set up a public energy company that gives Londoners clean, affordable energy. 2) To divest the London Pension Fund from fossil fuels. After over a year in office he's broken both. It's time for action. 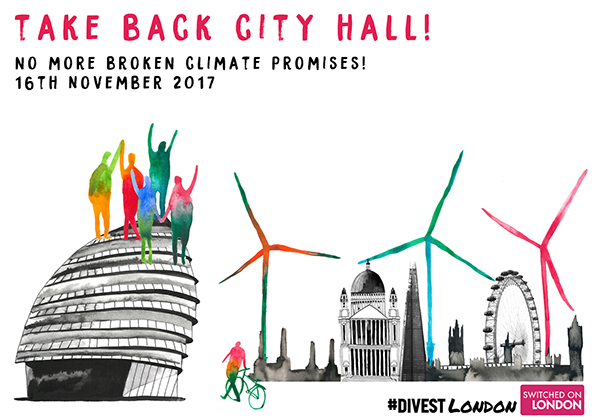 On November 16th, we'll be taking over City Hall to protest Sadiq's broken climate promises. You can find the facebook event here. Also, please take two minutes to send a response to the Greater London Authority's environment consultation to make sure Sadiq knows he won't get away with breaking his climate promises. You can do this here. We need to radically change how energy is produced and who controls our energy system. We need energy democracy. Please join us at City Hall on November 16th.